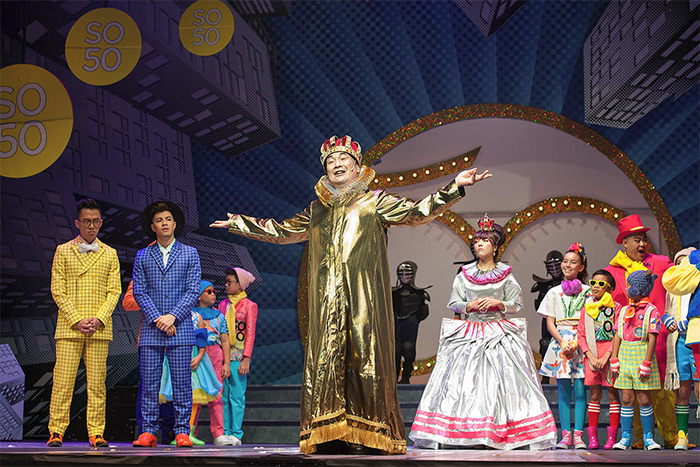 The pantomime has come to be associated with a set of recognisable traits: traditionally staged during the winter festive season, they are musical comedies based on folk stories and fairy tales, stuffed with songs, farce and some form of audience participation – with colourful gags for the children combined with sneaky social commentary for the adults. But in the beginning, there was Pan. Or so goes R.J. Broadbent’s A History of the Pantomime (1901). Broadbent doesn’t begin with the conventional trajectory of how the early English theatrical pantomime was heavily influenced by commedia dell’arte, a form of Italian performance from the 16th century whose influence spread over Europe, and, via Parsee traders, into regional forms such as Bangsawan. The very name Pantomime itself signifies Nature as Pan was amongst the Ancients, the allegorical god of Nature, the shepherd of Arcadia, and with ‘Mimos’, meaning an imitator, we have, in the combination of these two words, “an imitator of Nature,” and from whence we derive the origin of our word Pantomime. The pantomime then is both wildly pagan and deeply religious. Dionysus, the patron of theatres, was also god of wine-making and wine, ritual madness and religious ecstasy – often connected to excess, hedonism and the liberation from authorities who are both oppressive and repressive. These theatrical performances filtered down over the years to the Roman pantomimes, or the pantomimi, skilled silent performers whose command of gesture and dance were deeply moving. 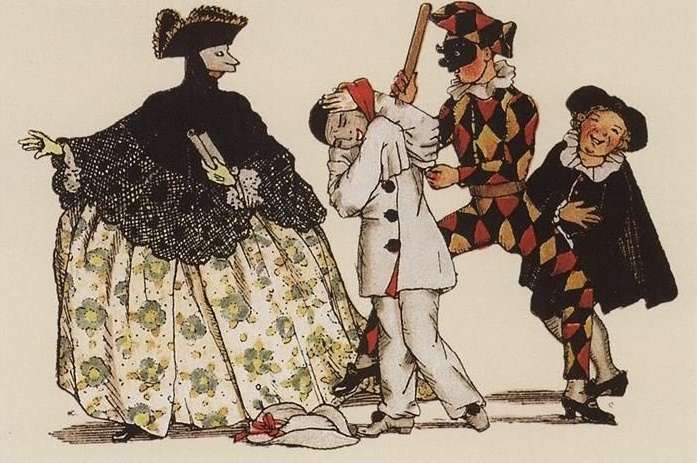 The figure of the Harlequin (Arlequino in Commedia), which later produced the English harlequinades featuring a host of comic clown characters, was also one of the Roman Mimes. As Christianity marched across Europe, the decadence and excess of pagan libations and celebrations were recast and reshaped in England into the medieval mystery plays, silent enactments of Biblical stories, and later the English mummers plays, in which itinerant troupes performed sword fights – often between Saint George and one of his foes. Despite the religious overtones of these performances, they still carried with them a whiff of the spectacular and the carnivalesque, a time for the public to come together, and through performances overturn the drudgery of everyday life and the strict laws that governed it. Singaporean writer Ng Yi-Sheng, in his review of Wild Rice’s Jack and the Bean-Sprout! (2006), puts it this way: “Every pantomime by Wild Rice is an act of revenge.” He details the pantomime’s colonial past in Singapore, a form associated with more conservative stagings by groups such as The Stage Club – a long-running theatre company, that is itself a remnant of the British colonial presence in Singapore. 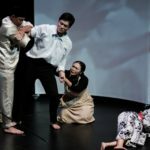 Wild Rice’s decision to appropriate the English pantomime for a Singaporean context felt like a confident first step in decolonising and reclaiming the theatrical form. The theatre company began their annual pantomime in December 2003 with Cinderel-LAH! 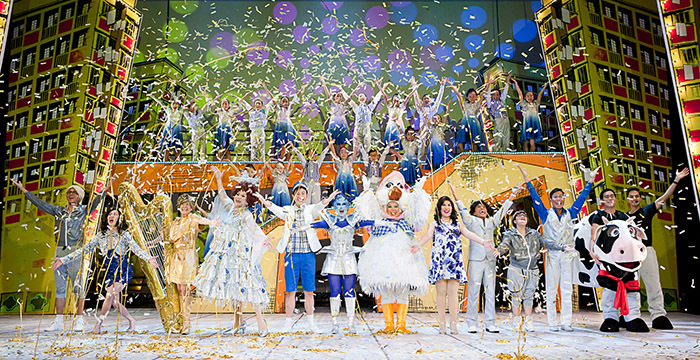 and, over the years, these crowd-pleasing year-end productions have become a staple of the Christmas season. 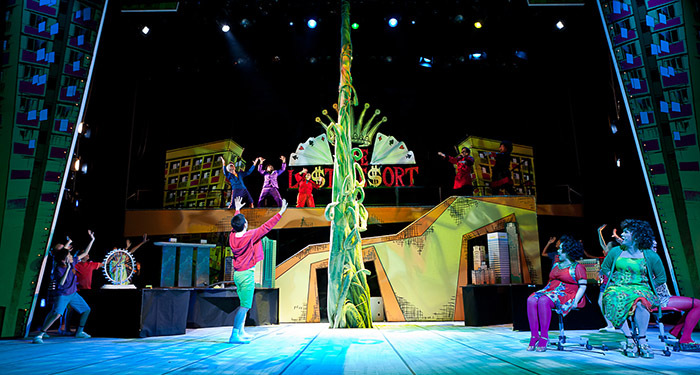 Jack & The Bean-Sprout, 2013 (W!LD RICE). 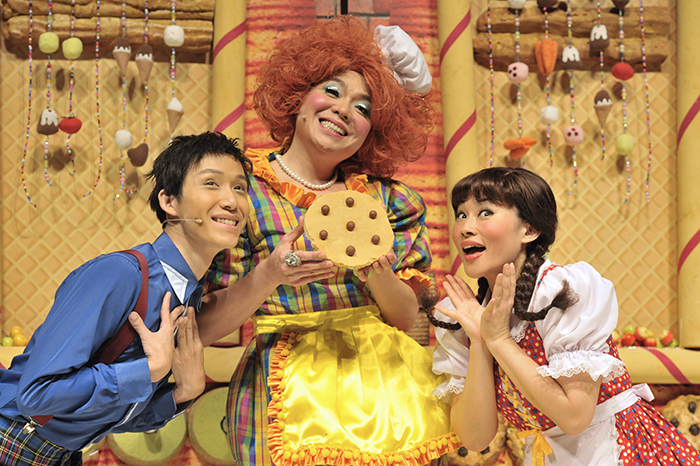 Wild Rice’s earlier subversions of the pantomime genre were relatively straightforward, with characters and subject matter of western fables and fairy tales adapted to a Singaporean context. Jack from Jack and the Bean-Sprout! (2006, 2013) is a Secondary Five student left behind by the strict academic demands of the education system, and his mother is a widow and single parent – their unconventional family has fallen between the cracks of any sort of social safety net. Cindy of Cinderel-LAH! (2003, 2010) is abused by her stepsisters and her best friend is a domestic worker from the Philippines who lives next door. Hansel and Gretel of the eponymous fairy tale (2012) are abandoned in one of the few rainforested areas of Singapore (Mandai) by a stepmother who’s trying to trim the family budget. And while a handful of the Wild Rice pantomimes weren’t explicitly set in Singapore or its HDB public housing estates, there were enough tongue-in-cheek references that allowed audiences to very quickly connect, for instance, the National Dress Parade of The Emperor’s New Clothes (2015) to Singapore’s National Day Parade and Golden Jubilee celebrations. 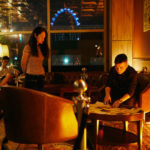 Playwright Joel Tan, who also wrote the lyrics, does several things in quick succession here. He makes reference to the rite of passage of O-level examinations (“My English got F9”), slips in a double entendre (“that’s not the only thing that’s rising”), and hooks the chorus on a very charming and specific Singlish euphemism (“I liddat liddat you”). 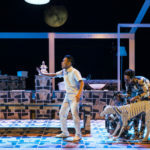 Jack combines his embarrassment at revealing deep emotion and his desire to demonstrate his adoration of Xeno – an obvious stand-in for a foreigner new to Singapore – with such a succinct turn of phrase that I, too, left the theatre humming. The Theatre Royal management at Birmingham therefore not only ignored official guidelines regarding make-up and caricature of leading politicians but added to the fun […] by including a dance banned by the Lord Chamberlain. 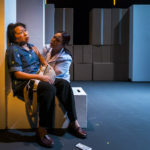 Part of the thrill of audience complicity is the Singaporean pantomime’s willingness to walk the line between the forbidden and the favoured. 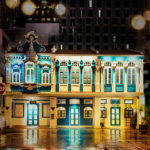 The Emperor’s New Clothes was performed at the end of 2015 as the relentless and often prescriptive SG50 celebrations were beginning to take their toll. It was set in an unnamed tropical isle and featured a narcissistic emperor, Henry Lim Bay Kun, who first spends a large chunk of the national budget on an extravagant fashion parade (the National Dress Parade 49, or NDP49), then is furious at the foreign press for not lavishing praise on his outfit and promptly imprisons them. Sound familiar? The pantomime crams in as many nudge-wink references as it can, with nods to Singapore Idol, British colonial rule, the Internal Security Department, and Operation Spectrum (known here as Operation Plectrum). The ISD and Operation Spectrum, in particular, carry significance as an institution and an event of political contestation. There’s another act of political resistance at work in the Wild Rice pantomime. While cross-dressing and drag are de rigueur for the English pantomime, I’d argue that in Wild Rice’s case these celebrations of queerness play a deeper role in a country where homosexuality remains illegal. Characters in drag still tend to play the villainous characters – the ugly stepsisters in Cinderel-LAH!, the evil wizard Abba-k’adab-rah in Aladdin, or the witch-like chef in Hansel & Gretel – but there is often little malice in their eventual comeuppance and the conclusions of the pantomimes tend to embrace the adage “all’s well that ends well” in welcoming friendship and forgiveness. The same goes for characters whose politics are not necessarily aligned with those of Wild Rice’s – the lessons remain constant: justice, not vengeance; kindness, not hate. For all its bald humour and (occasionally) bad puns, the Wild Rice pantomime isn’t all colourful frivolity. Beneath the trappings of light family entertainment is a vein of radical empathy, and radical hope. 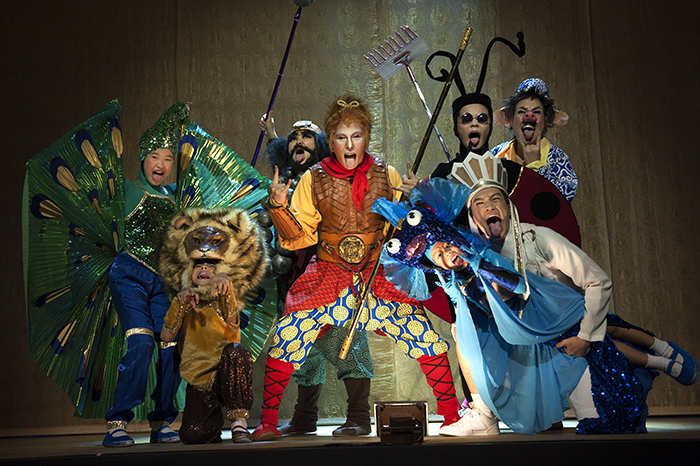 By 2014, more than 200,000 audience members had come to see Wild Rice’s annual pantomime, and the company seemed set on evolving the form it had, over more than a decade, adapted and made its own. Monkey Goes West (2014, 2016) marked their first attempt at putting stories from Asian folklore front and centre, drawing from the 16th-century Chinese classic Journey to the West. The original novel centres around the Buddhist monk Xuanzang and his pilgrimage to Central Asia and India to obtain sacred texts, assisted and protected by his disciples Sun Wukong (the Monkey King), Zhu Bajie (Pigsy the pig) and Sha Wujing (Sandy the water buffalo). Monkey Goes West was sculpted into the sweet coming-of-age tale of a Singaporean boy discovering himself and rediscovering his family, sealed with an irresistible earworm of a theme song. Like the main characters in our Mama White Snake—part human, part snake—I think our pantomime itself is also a hybrid being. It’s not necessarily a fusion of East and West, which implies that a single thing has been created from component parts. 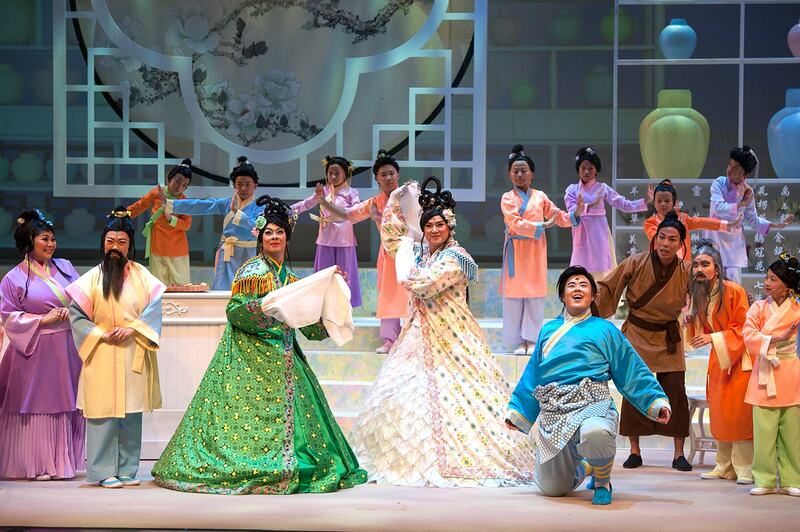 Rather, I’d like to think of intercultural work as a collision between two things (such as the British pantomime and Chinese opera, or English lyrics set to a Mandarin-ballad melody), which then splinter off into multiplicities, revealing shimmering, unexamined facets of each culture. Cultural fission, perhaps? Mama White Snake, 2017 (W!lLD RICE). 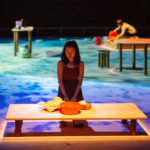 A Singaporean audience feels like the prime subject on which to test these intercultural encounters, an audience that’s largely grown up with as many stories of local hantu as those by Enid Blyton. 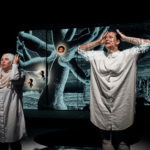 The pantomime’s retelling of the canonical fable or folktale has been the key to its longevity, the blend of the familiar with the contemporary ensuring that it must reinvent itself to stay relevant but also pay homage to what has come before. It feels fitting that Wild Rice has built their own shape-shifting pantomime from a form whose history stretches from pagan celebrations to the repressive Middle Ages and the Victorian era, picking up elements of satire, clowning, and making merry along the way. Bakhtin, Mikhail. (1984). Rabelais and his World. (Helen Iswolsky, trans.). Bloomington: Indiana University Press. (Original work published 1965). Broadbent, R.J. (1901). A History of Pantomime. London: Simpkin, Marshall, Hamilton, Kent & Co., Ltd.
Sullivan, Jill A. (2011). The Politics of the Pantomime: Regional Identity in the Theatre 1860–1900. Hertfordshire: University of Hertfordshire Press. 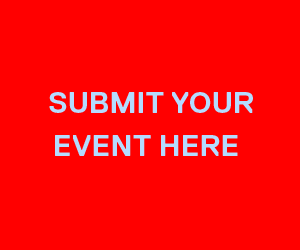 The online archives of The Flying Inkpot and Wild Rice. Guest Contributor Corrie Tan is a freelance writer. 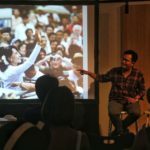 A former arts correspondent and theatre critic with The Straits Times, she has also written about performance for The Guardian, The Stage, Exeunt, and BiblioAsia.